New album recently released, almost 50 years on the road. Simultaneous exhibitions sold-out over the world. 2013 is definitely David Bowie’s year. The chameleon artist, keeps surprising his fans and critics with every new move. Adding to this effervescent and radiant vibe, Amsterdam’s most important photograph museum, Foam, also has its contribution to this year full of celebration: a selection of photos shot by the famous fashion photographer Brian Duffy, which portraits unique Bowie’s moments between 1972 to 1980. 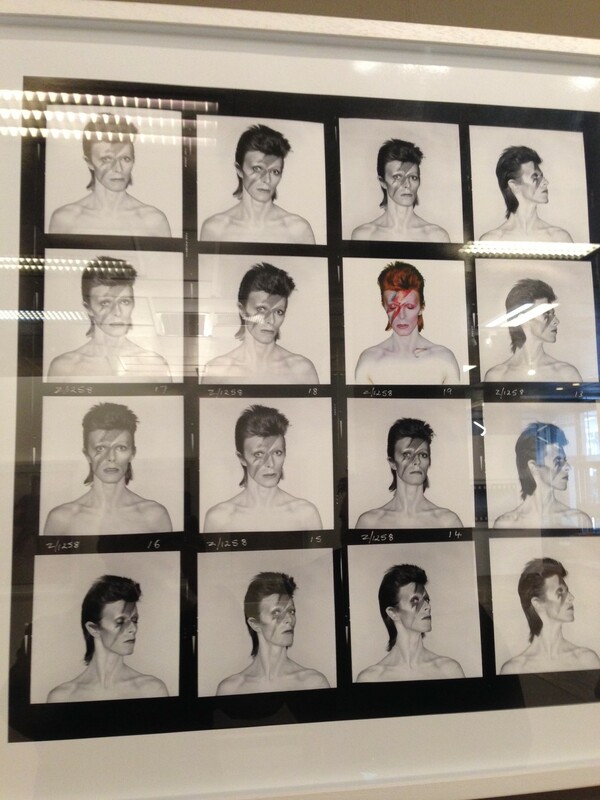 In the very last week of the exhibition, we had an insight into photographic sessions, that illustrates the long period that Duffy worked with David Bowie on his very own iconic look, including three of his most famous album covers – Aladdin Sane (1973), Lodger (1979) and Scary Monsters (& Super Creeps) (1980). 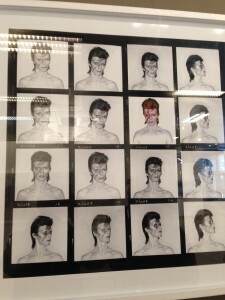 We see a very self-confessed Bowie in the unreleased scenes of Aladdin Sane and Lodger. The photographer has set the light for the extraordinary music and captured the living model for a pre-punk rock era of London, emerging success. Within Foam, the exhibition shows images in different sizes and styles. A collection of Duffy’s work was also on sale and available to buy in different range of sizes and prices. One of the most expelling artwork is the cover-shot for Aladdin Sane, the sixth album, released by RCA Records in 1973. A subjective ideal in postmodern photography showed a way before Adobe Photoshop and other digital methods and gained great success. Together with the music, it was the highest-selling LP in that time. Next is the negative version of Aladdin that clearly shows the delicateness, never experienced before, yet existing before the famous cover artwork could have been realized. Eyes open,- a new whole perspective through a set of pictures, however never used for commercial use. With Lodger, the thirteenth studio album released in 1979, Duffy created a new set of pictures that draw the audiences’ attention through perspective and color, realized through different single shots and technical methods merged together. 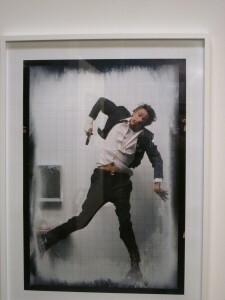 Visually realized in unique shots, the outstanding composition showed a surrealistic angle of Bowie attached to the wall. 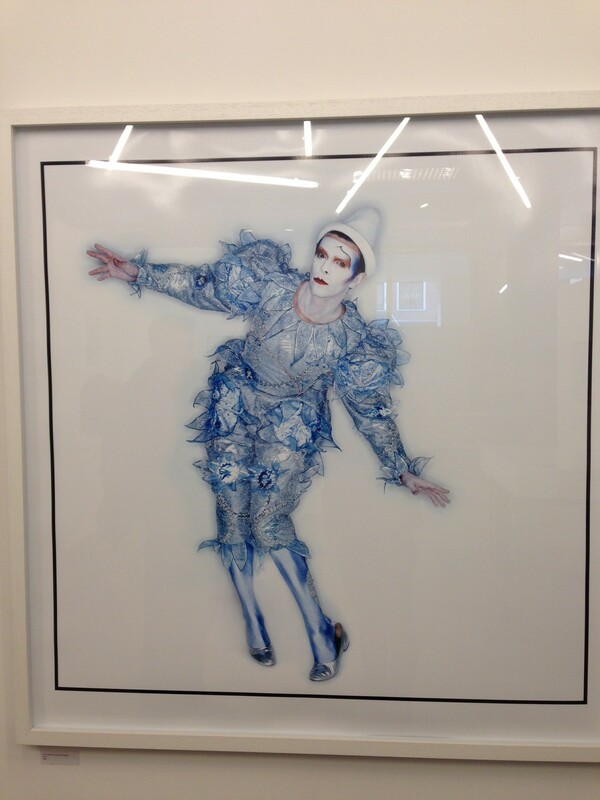 On Scary Monsters (& Super Creeps), title track for David Bowie’s album released in 1980, we see a serial fashion photography from the 80s, his late photography. The exhibition’s theme is very attractive itself. 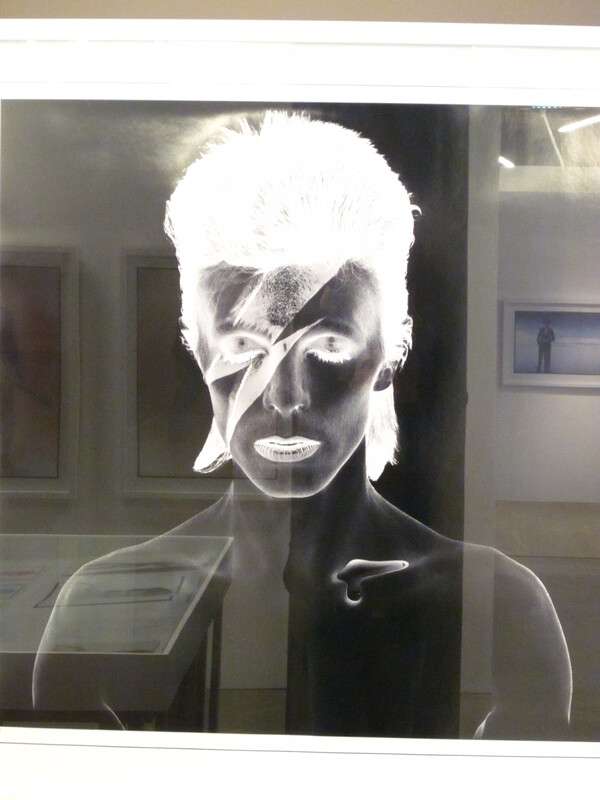 Both, Brian Duffy and David Bowie are characters with an extraordinary material to be displayed, but what we found was a bit disappointing. There was basically no significant captions nor dates given, and besides the online descriptions, there was almost no way to learn more about the backgrounds nor about behind-the-scenes. Poorly presented in the way of displaying the photographs, the light set up was terribly arranged and none of the images could have been viewed without disturbingly light reflexes, also seen on our photographs from the exhibition. All displayed photographs are also online and there is barely no new information while visiting the exhibition. Too narrow, confusing and no brochures to follow up. However, we got a great insight into the creative process presented through different set of pictures, but again, the connections themselves were almost too confuse to draw. Serials did not seem to be in one place, ordered or sized, therefore an essential point of understanding was missing for what is actually behind the set ups. It was difficult to distinguish and say what was used for the later commodification process, and based on that, it confiscates the notion of a successful idea to present us with new insights and background information. 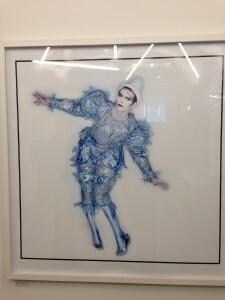 Without the extended knowledge of Bowie’s artworks and musical era beforehand, no correlations could be found in terms of connections to Duffy’s work, his career or manifest. The only extra was a documentary playing on TV, later found as a reference on YouTube, with a whole one hour coverage. It doesn’t seems to be a good way of presenting a complete long documentary just for the sake of having it. It is hard to follow when skipped in the second half of the coverage, not knowing basically if it is showing Duffy’s career or other information presented in the exhibition. 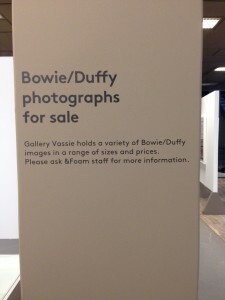 Nevertheless, it’s a unique opportunity to see original Duffy photos, get to know better his work and the man behind the lenses, and of course get some David Bowie’s glimpse. « Crowdfunding indie games, catering the long tail. Foam Lab is Watching You!